When AT&T took the DirecTV requirement off of their unlimited data plan a couple of weeks ago in reaction to the rest of the US carriers all making unlimited moves, I can’t say that people exactly warmed to AT&T’s offering. Nothing was really different about the plan, other than the fact that anyone could buy it. It still didn’t include tethering and wasn’t really that cheap when compared to others. Come this Thursday, AT&T is giving in a bit and mixing it up with two new plans called Unlimited Plus and Unlimited Choice. Below, you’ll find an image that breaks down each plan, but as the names suggest, Plus is the better of the two in terms of features. 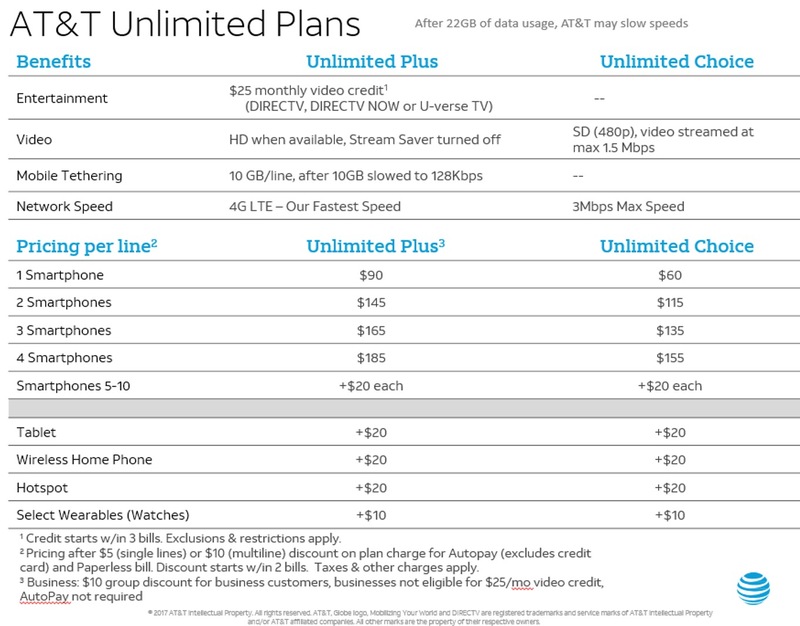 Unlimited Plus starts at $90 for the first line, includes HD video (I’m assuming at whatever the content provider provides), 10GB per line of tethering per month, and full 4G LTE speeds. AT&T is looking to sweeten the deal further, though, if you are interested in DirecTV, DirecTV NOW, or U-Verse TV subscriptions. As long as you sign-up for one of those services, they’ll toss in a $25 “monthly video credit.” The big advertised deal is going to be Unlimited Plus, along with DirecTV for $115 after the credit. That should mean $90 for your wireless plan + $50 for DirecTV service – $25 credit. If you don’t want DirecTV, they are doing a similar deal for DirecTV NOW that could get you into both Plus and NOW for $100 per month. The Unlimited Choice plan is a bit different. This plan starts at $60 for a single line, does not include tethering or the TV credit, features SD (480p) video “streamed at max 1.5Mbps,” and capped overall data speeds at 3Mbps. Yes, this is fully throttled wireless service. But hey, $60 isn’t bad…I guess? In other notes, just know that you’ll need autopay and paperless billing in order to get advertised pricing, plus AT&T can throttle you at 22GB of usage on a line. Sign-up for AT&T unlimited plans here.